I met Jessica Pezalla a year and a half ago when I attended one of her shibori dyeing workshops and we've kept in touch ever since. We like to meet up once once in a while, to attend an event, to share a cup of tea or to brainstorm and discuss future creative endeavors. The last time we met was at a friend's studio tour. There, Jessica mentioned that she was planning on making bath salts as gifts for her family, and I mentioned that I've been wanted to make more candles ever since I had taken a class a couple weeks ago. She was interested in the project too, so we decided to do this together and set a date. We did a little research, figured out what tools we needed, went shopping for supplies and met up at her studio for our little collaboration on a very cold December day. The day before, Jessica had been foraging wicks and trims. So while we were waiting for the wax to melt, she taught me how to make a wreath (no picture was taken, I am not super proud of my oval shaped creation). This is what I love about Jessica, her ability to create. 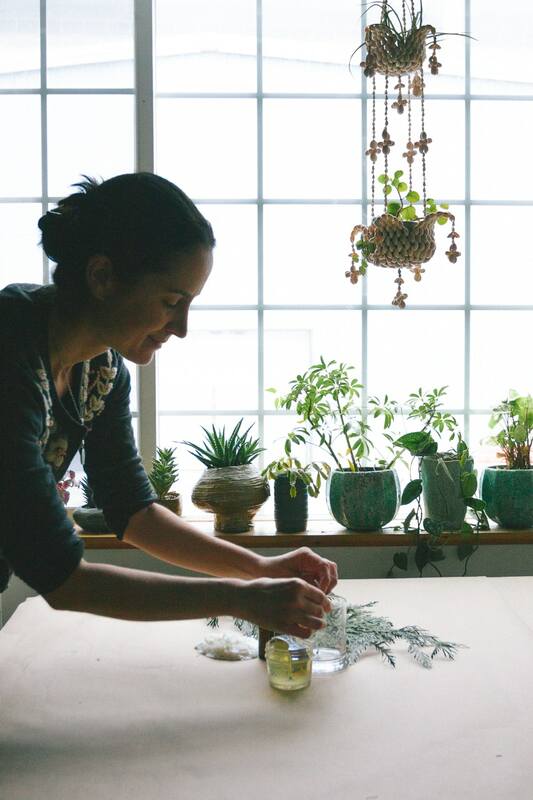 I admire the work she does for her studio, Bramble Workshop, from papier mâché icebergs to flower mandalas. Oh and did I mention that she's the owner of Hazel, the most well-behaved and the sweetest dog I've ever seen? The afternoon flew by and by the time I went back home, the streets were covered by a thick blanket of snow. As soon as I arrived home, I started baking the bread I had left rising all night long, attached the wreath to my door, turned on the fireplace for your home series on Netflix for a cozy night at home and patiently waited for my candles to cool down until the next day. 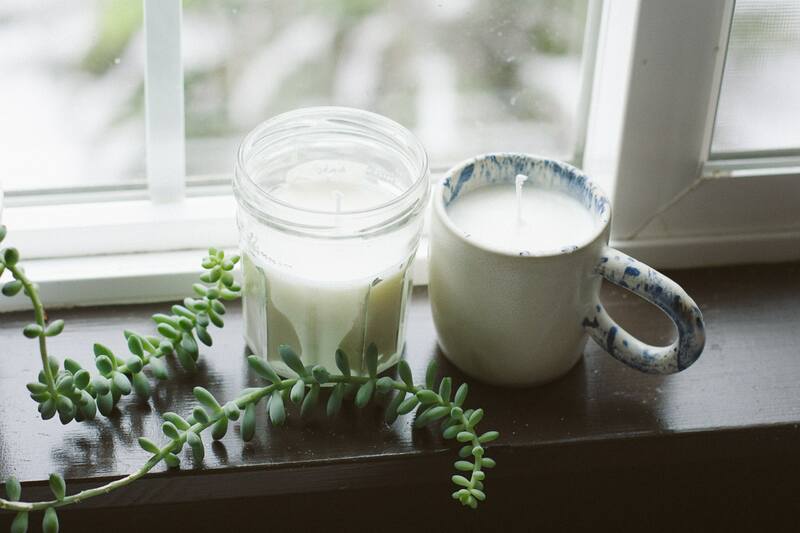 Candles are the perfect hostess gift, stocking stuffer and are very easy to make. The hardest part is to decide on a scent. There are so many to chose from! Fill the pot with wax flakes and place it on the hot plate or double boiler. 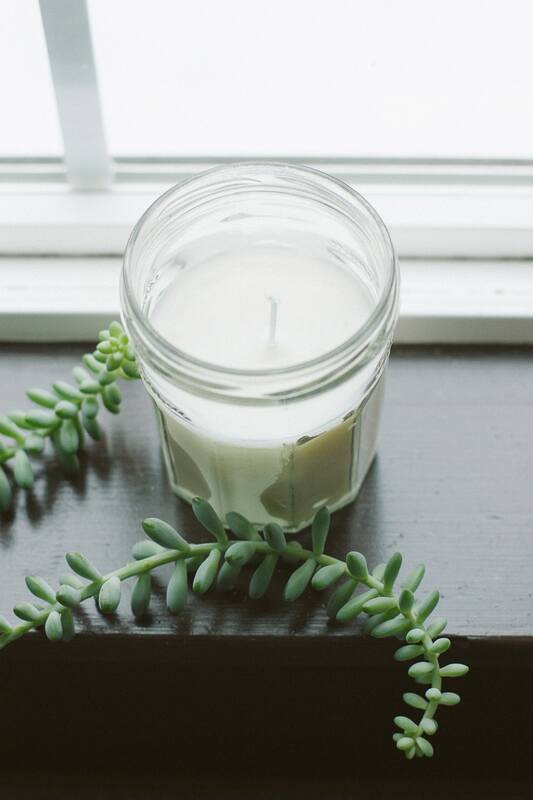 Heat the wax to 185 F. It is also a good idea to pre-heat the containers in which you will pour your candles to about 125 F to keep the wax from pulling away from the sides. Remove the pot from the heat, add your fragrance and stir well. 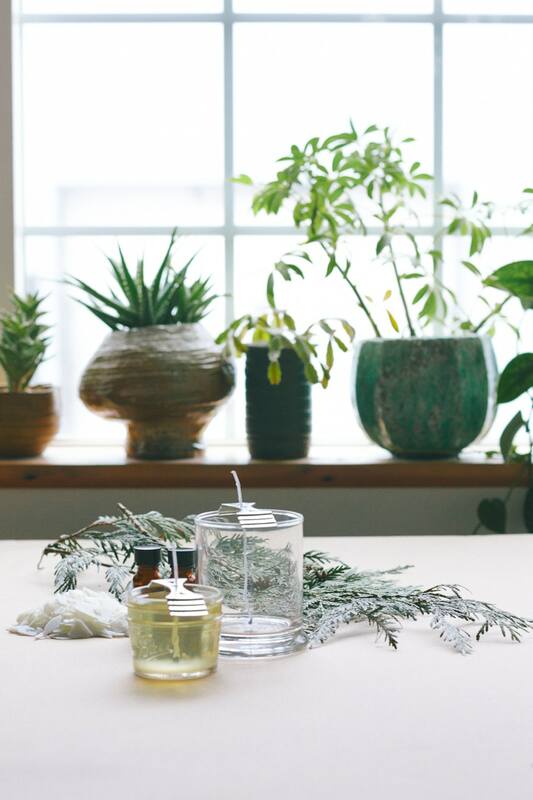 If you keep your pot on the heat source when adding your fragrance, it will evaporate out of the wax. Glue and center the wicks. While the mixture is cooling, place a glue dot on the bottom of each container and stick a wick at the center. When the mixture temperature cools to 135 F, pour the wax into the containers. Place a wick centering bar on the top of each container and pull the wick into the opening. It will keep the wick straight and centered while the candle is cooling. Let the candle cool down. Let the candles cool at room temperature overnight before first lighting them up. Trim the wick to 1/4 in. before lighting. Be aware that candles have memory. So the first time your light your candle, make sure that the wax melts all the way to the edge to prevent tunneling. Scent-wise, the options are limitless. For this batch of candles, I used a fragrance/essential oil blend (the flashpoint is indicated on the bottles) and Jessica used essential oils. Whatever you chose, remember that not all essential oils are safe for burning, so read the labels carefully. As for containers, I also used some Bonne Maman jam containers and a ceramic cup that I collected from the "messed up shelf" at my ceramics studio (#reuse). My favorite fragrances are sandalwood, palo santo, birch... All the scents that remind me of an evening by the campfire in the middle of the forest. What about you? What are your favorite scents?